OK, more than ten. And a couple of reasons not to. But ignore those, and go anyway. You will never regret it. We’ve always wanted to see the Greek temples at Agrigento. So we finally went. 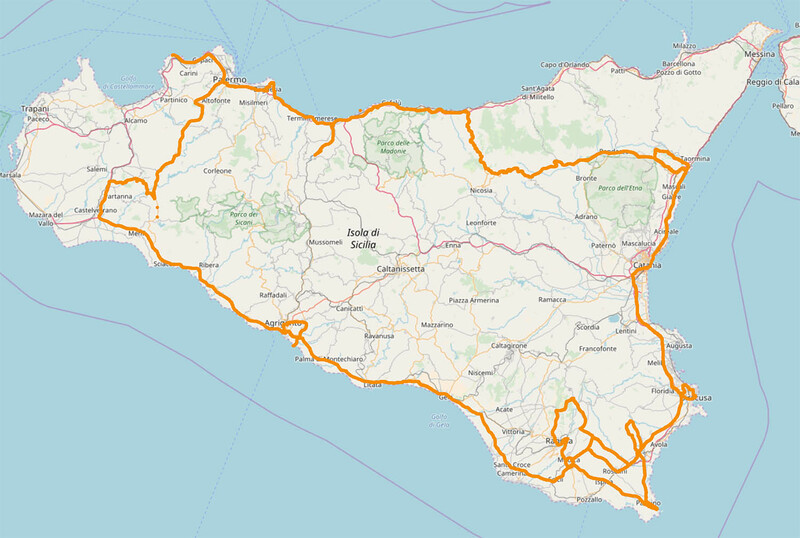 Palermo, Monreale, Poggioreale, Gibellina, Sciacca, Agrigento, Modica, Ragusa, Noto, Siracusa, Catania, Taormina, Randazzo, Troina, Castel di Tusa, Cefalù, Caccamo, Bagheria, Palermo. 1,680 km. Apart from swifts, thousands and thousands of them, and many sparrows, we were disappointed. We saw two bee-eaters. Some hooded crows. Lots of magpies. And a dead rat. 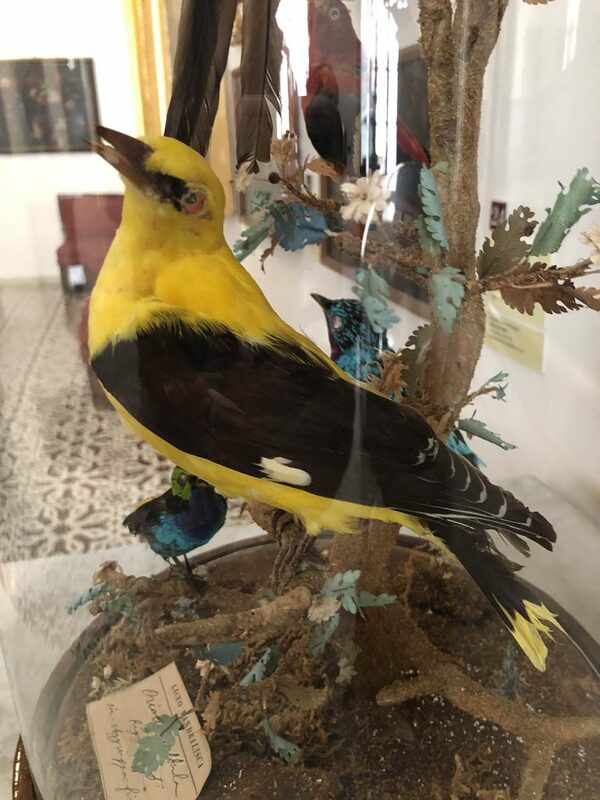 Oh — we saw a Golden Oriole, but it was stuffed in a museum. Agrigento was the driving reason for coming, and the Valley of the Temples did not let these tourists down. There’s not much I can add to the volume of writings about this line of temples along a ridge (not in a valley; it should be called the Ridge of the Temples, not the Valley of the Temples) except to say they exceeded even my expectations. If Greek temples are your thing, this is a peerless site. 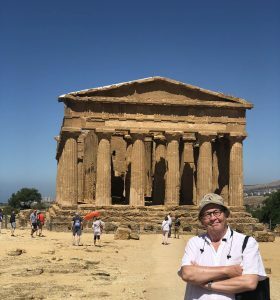 I still think the temples at Paestum might be bigger, but Agrigento has a far finer location overlooking the deep blue sea. The first one, the Temple of Juno, is on the highest mound and then the ridge stretches away in the distance. The wide, easy Via Sacra connects them all. There were the anticipated crowds of tourists but somehow they didn’t impinge; it never felt overcrowded or brash and touristy. The temples remained remote and, dare I say it, almost sacred. Of course they are now fenced off so we can’t wander round them at will, but that doesn’t really detract. Better to view them as entities. The fences are elegantly designed and do not intrude. The Temple of Concord is the jewel. Because the builders constructed it on a substratum of what seems to have been jelly, it has resisted all earthquakes. For want of a better name it is called the Temple of Concord (or Concordia) because after 2,448 years we have forgotten in which god’s honour this beautiful building was erected, and by whom. Well, temples by another name. The stone they use in Noto makes Cotswold stone look drab and grey by comparison. It is positively golden in the sun; such a beautiful colour, and it wears well — the carvings are as sharp and clear today as they were when they were created fifty years after the 1693 earthquake. 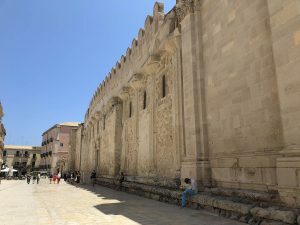 We saw or visited cathedrals in Palermo, Monreale, Agrigento, Modica, Ragusa, Noto, Siracusa, Catania, Acireale, Randozzo and Cefalù. 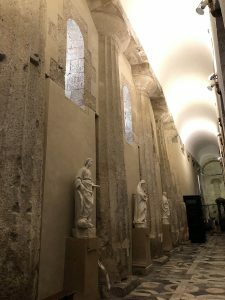 In Syracuse we walk into the cathedral and we are stunned to find it’s an original Greek Doric temple dating from the 5th century before Christ, dedicated to Athena, with a Christian church inserted into it. In addition, a large inscription on the walls in Latin claims that this is the first Christian church in the world. A lot to take in. I leave baffled, uncertain and confused. Von excelled herself in her choices, but then she always does. 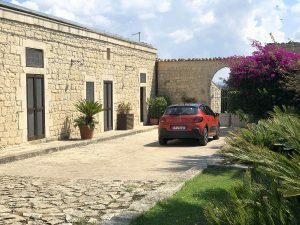 First requirements were for a pool and parking, except in Palermo and Agrigento. The best by a country mile was the huge Villa Rassabbia in Frigintini, near Modica. This was a small country estate at the end of a kilometre-long drive. Wow. And wow again. We had five days here, mainly because of the location and the pool — but it was too cold for swimming most of the time. The weather was a continuing disappointment. Almost always good, occasionally excellent, only one let-down: a tourist trap lunchtime restaurant in Palermo. The Inzolia grape makes for a very drinkable white wine. 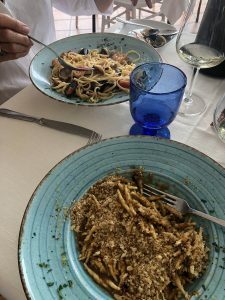 My best meal was a pork fest at Chiaramonte Gulfi, up in the mountains. The seafood was uniformly good. I never really understood swordfish and tuna before now — for me tuna always came in flakes from a round tin — but they are insanely good, especially when eaten grilled in the middle of a fish market in Catania. Here is the missing link between fish and meat. And in the Mandralisca museum in Cefalù we saw a krater, or Greek vase. Now I’ve seen a thousand of these in my time, and I can assure you that when you’ve seen one, you’ve see them all. Except for this one. 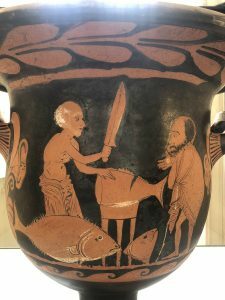 Instead of fighting men or dancing girls, this Greek vase has a depiction of a fishmonger slicing up a tuna for a customer. We had seen the exact same scene in the Catania fish market two days earlier. Nothing has changed in 2,400 years. It is fascinating. It’s all good. You hardly ever seen chicken on a Sicilian menu, then again I hardly ever order it. You won’t see liver, or kidneys, or ris de veau. Inland they do fabulous pork. All the meals will cost between €40 and €60, depending upon your wine. We were blown away. 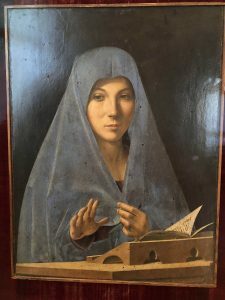 Antonello da Messina’s Annunciate has to be the most beautiful painting in the world. It leaves the Mona Lisa in the dust. 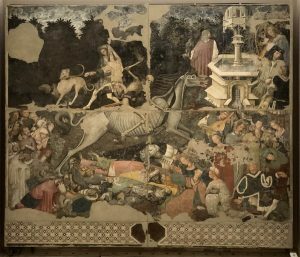 The Triumph of Death in its tattered glory is both horrifying and gripping. 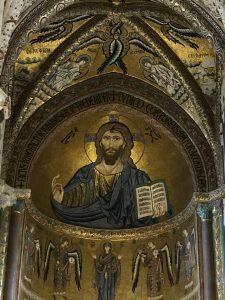 The golden mosaics in the Capella Palatina, the Materana and the cathedrals at Monreale and Cefalù made us weep in wonder. Christ as rock star. 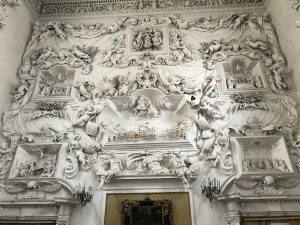 And I would fly back to Palermo just to see the stucco work by Giacomo Serpotta in the Oratorio Del Rosario di Santa Cita again. 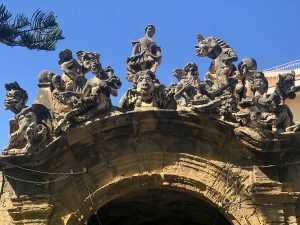 The Battle of Lepanto — in stucco plasterwork! From Norman through Mannerism to Baroque — the design and workmanship is exquisite. Then they just seemed to stop. We didn’t see any interesting modern buildings — except if you look under Follies. 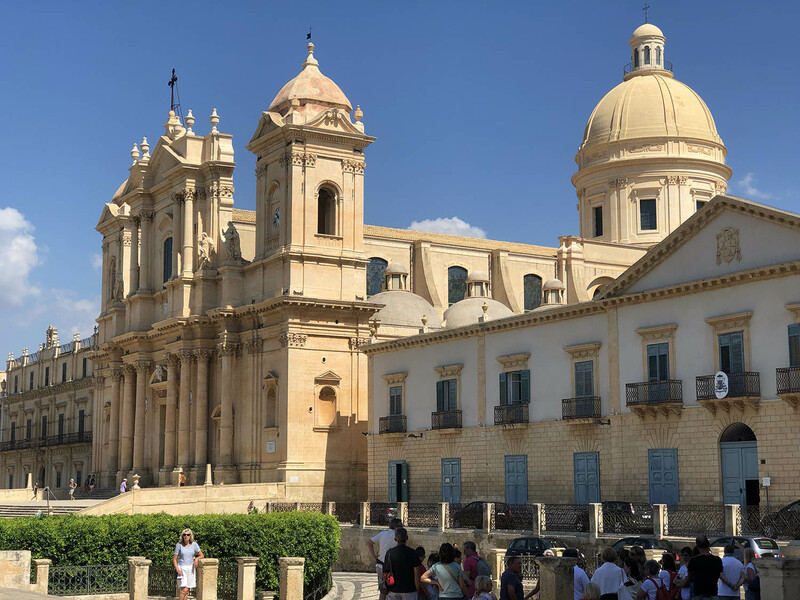 The Sicilian Baroque came as the result of the 1693 earthquake which destroyed Ragusa, Modica, Noto, Catania, Siracusa, Augusta and killed 60,000 people. There was a library in our shack in Frigintini, where I found John Julius Norwich’s Sicily, the most wonderful history of the island. I was thinking of stealing it but read it quickly in four days instead. The island has never been independent. For three centuries until 1713 it was Spanish. What we knew as the Gwyn Tree, later found to be the Norfolk Island Pine, an invasive species, is everywhere. 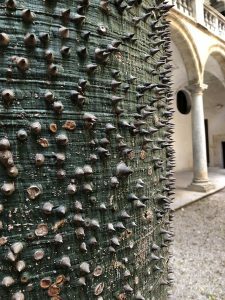 In the courtyard of the Oratorio Del Rosario di Santa Cita was a Kapok tree. I have never seen anything like it. 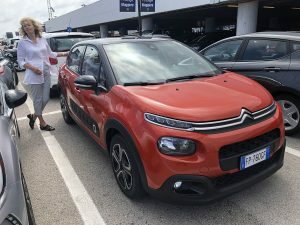 A brand-new (17km on the clock) orange Citroën C3. Wonders of modern science — the sat nav showed petrol stations with the current price per litre at each one. The Citroën C3. Great little car! 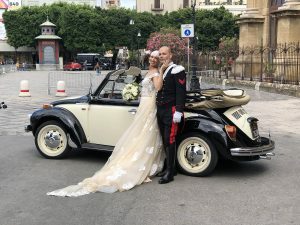 We decided to get the free bus that tours the centro storico of Palermo. Being free, it’s packed with dewy-eyed tourists, parsimonious locals and thieves. Von and I boarded with eager anticipation, but when I say packed I mean the bus was rammed. Standing room only, and a tight press at that. After a couple of stops Von managed to squeeze into a seat, where she found her handbag had been unzipped. Simultaneously I felt two fingers in my back pocket and I turned round to confront a large young man who had been standing behind me. “Hey!” I shouted in English. “What are you doing with your hands in my pocket?” I checked my 20 euro note. It was still there. “You were trying to nick my money! Thief!” He shrugged. “No comprende.” The bus suddenly became as silent as a London Transport double-decker, apart from a young man in a blue striped shirt at the front who was sniggering. A seat became available and I swung into it. The young man was standing right next to me. “You. Are. A. Thief.” I said to him slowly. He was good at shrugging, I’ll give him that. There was no other reaction from anyone on the bus except redoubled sniggering from Mr Stripey Shirt. “Ladro!” I cried. Now everyone appeared to look puzzled, because as Von later pointed out, Ladro is Spanish, not Italian*. 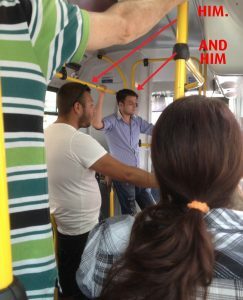 Some more people got on the packed bus, and an elderly British man was now standing next to me. He said to his wife “I can feel someone’s fingers in my back pocket.” I said “That’s because the bloke behind you is robbing you.” “Lucky I haven’t got any money there then,” he said, and got off the bus. The incompetent pickpocket and his stripey pal — they were working together, perhaps tutor and pupil — got off at Teatro Massimo and stood giggling on the pavement. I was bloody annoyed, but unrobbed, as was Yvonne. I can’t recommend the Free Bus to anyone. *Even later, we discovered that Ladro is also Italian, so I can only assume that everyone on the bus was complicit. We foraged for ourselves, and usually had yogurt and honey. Ryanair, followed by the weather. Delicious, as expected. But ask for a cappuccino and it’s a toss-up whether it’s made with fresh milk or UHT. They don’t seem to mind. We do. After 11:00 my café (espresso) was inevitably accompanied by un amaro. Yum. 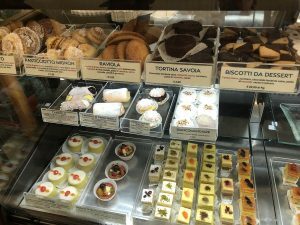 Then one of the big treats of the holiday — a visit to the Café Sicilia in Noto, recommended to us by Milo’s friend Namrata and featured in a Netflix documentary which we watched, salivating. No room outside; there are only about six tables and all the shady ones are taken. Inside is full as well, but it is air-conditioned and we’re not going to be back here for a while (it’s my first time in 71 years) so we just wait. It only took another ten minutes and it was our fault, because we arrived at 10:50 on a Saturday morning, probably their busiest time of the week. The cannolo alla ricotta and the granita alla mandorla with brioche arrive and they are simply exquisite. If this isn’t the best in the world, then maybe the one next door is. I want to try another one, but I dare not even mention it. So, saddened, we pay and leave, but not before congratulating the patron Corrado Assenza. “We saw you on telly!” we gushed intelligently. OK, Corrado Assenzo (see previous entry) and Montalbano. Yes! In Scicli the traffic was held up by two WPCs for 10 minutes. Finally a decrepit little blue Fiat came up the hill, and the driver was Montalbano himself. They were filming an episode at the cemetery. What a treat! Extremely disappointing. We anticipated hot and sunny, but that was reserved for London and Harlech. In Sicily we had torrential rain (and I mean torrential) and the temperature down to 14°C (58°F). Most days were cloudy. Here’s an example: We head up the road to Noto Antica and the first spots of rain hit the windscreen (Von is driving). Within five minutes it is raining so hard that the road has disappeared under water. The noise of the rain on the car roof drowns out the radio. I haven’t experienced rain of this ferocity since I was three years old in West Africa. It is way beyond torrential. We slow to a crawl, the wipers hurling themselves uselessly from side to side. We have a bow wave; we are actually driving along a river. Thunder is crashing overhead, the only noise that’s louder than the rain on the roof. On the small, narrow, up-and-down side roads leading to Noto Antica we are alternately kayaking down a steep hill, then a brief lull through short flat flooded sections, then turning a corner to face a wall of water rushing down the next hill at us. It was unbelievable. The little Citroën coped well, but then it had a skilled driver. We encountered another small car through the blinding rain on the one-track road, and he courteously backed up about a hundred yards so we could squeeze past amid flashes of lightning. We crossed a bridge under about 18 inches of standing water, then drove into another waterfall coming down the road. We reached a large section of ruined wall and pulled over out of the way of the downhill river into a relatively unaffected parkplatz. We sat in the car, stunned by the ferocity of the rainstorm. 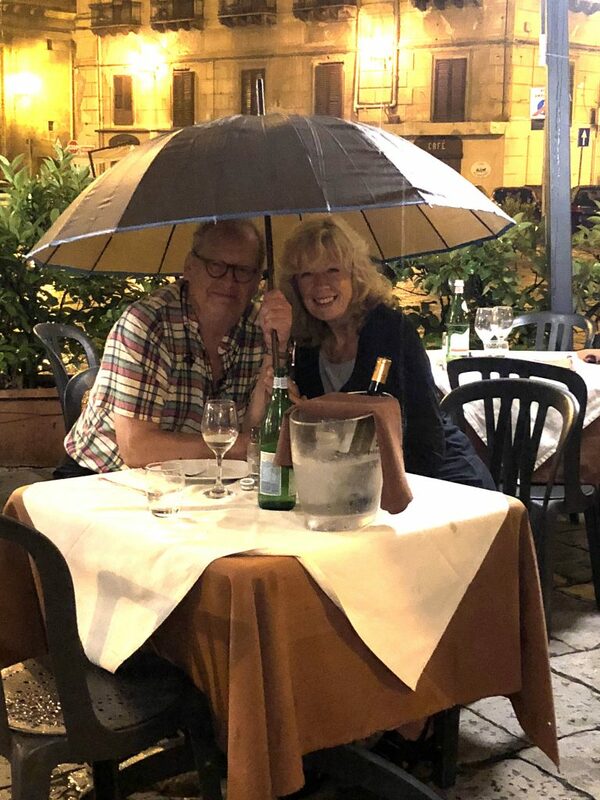 After about ten minutes it abated sufficiently for me to get out of the car with Von’s trusty umbrella and wade through the river road to the gateway of Noto Antica. It is of course a huge and deserted site, and I only venture in a hundred yards before the rains come again and I scuttle back to the car. Now it really sets in, and follows us every inch of the way back down the hill on the main road to Noto. The drains can’t cope and are jetting water a foot into the air. We are travelling marginally faster than the water is flowing down the road, but new side rivers are joining at an increasing rate, walls of water coming in from left and right. This has been great fun, but now a shadow of doubt sets in; this is serious stuff, and we need to take care. It’s bad now, but it could get worse. We swim into Noto, downhill all the way, and Von neatly slots into a parkplatz between two rivers, formerly roads, to see what will develop. So an ice-cream is out of the question? The rain is unceasing. Exasperation is now overtaking trepidation. We decide that there’s no point in hanging around in Noto; it will never stop. We make a break for the coast — it’s bound to be sunnyish. So we head off and the storm follows us every inch of the way. It eases up as we splash into Marzamemi, a seaside resort which is under about 18 inches of water. Every road is flooded, the car parks are flooded, cars are driving aimlessly round with nowhere to stop and the shop and restaurant owners are peering glumly out watching their trade driving past. It’s hopeless. If we found a place we could stop at we’d have to take our shoes and socks off and wade through unspeakable waters — remember the drains have flooded too. We give up and drive uphill to Pochino, but that’s a drab little town with nothing visible going on so we settle on going back to Modica. 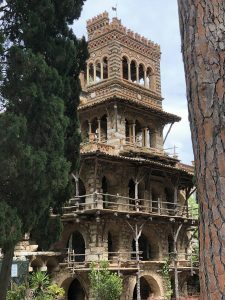 Although we say we were drawn to Sicily because of Agrigento, the Florence Trevelyan gardens in Taormina were as big a draw for me, because of their follies, surprise surprise. They didn’t disappoint. 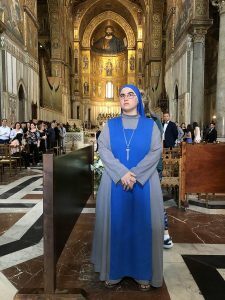 Florence was an Englishwoman who moved to Taormina in the 1880s. She created this garden from 1890. Most photographs, including mine, do not begin to do justice to these structures. In brick, and stone, and wood, and cloth, and lava, they are much larger than they appear to be. The seven storey tower at the east end of the garden is simply massive, one of the larger follies I have seen anywhere. A plaque on the side reads ‘THE BEEHIVES. FECO COSTRUIRE L’ANNO 1899 FLORENCE T CACCIOLA TREVELYAN’ and I know the only translation you could possibly need is ‘BUILT 1899’. But why The Beehives? What was this strange lady of leisure thinking when she built this array of odd, but similar buildings? They share a common identity, but as far as I can see there there is no precedent. There is nothing like these structures anywhere else. They are totally original, acknowledging no ancestry, no influences. Florence Trevelyan was a true original, blessed with money and an off the wall taste. 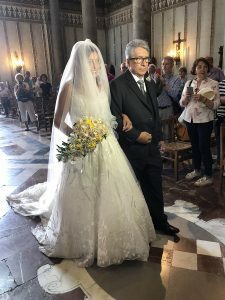 She had arrived in Taormina as a wealthy spinster, but soon allied herself with Salvatore Cacciola, not a fortune hunter as a cynic might expect but a local Taorminan politician with his own palazzo, soon to marry Florence and become Mayor of Taormina for many years. The small town of Gibellina was totally destroyed in the 1968 earthquake and is now completely abandoned and uninhabited. The outskirts are the expected shattered ruins scattered along the hillside, but then we come across one of the greatest sights in Sicily — a mountainside covered five feet deep in concrete cut through with winding paths, covering virtually the entire town plan of ruined Gibellina, the cut paths marking the old roads and alleyways through the town. 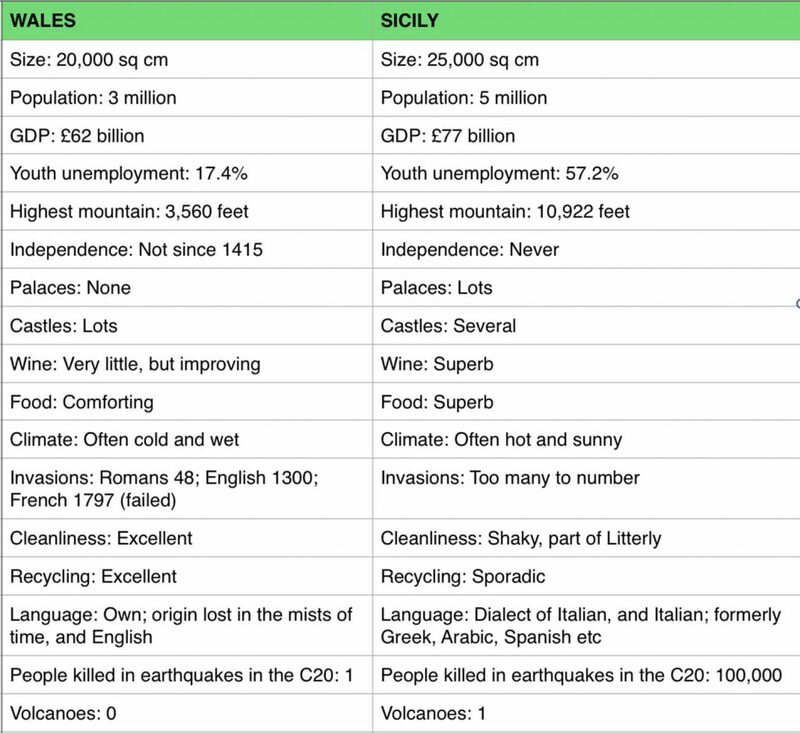 Had we not been watching the Giro d’Italia on Eurosport to get a preview of Sicily we would never have known of this. It is a work of art by Italian sculptor Alberto Burri, and I have to say it is intensely moving. It brought a tear to my eye, not a difficult thing to do if you’re me, but emotional nonetheless. 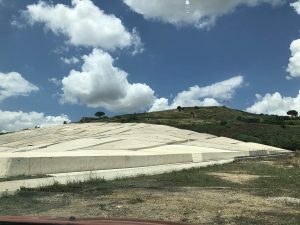 Of course they ran out of money, and the project was left unfinished, then Burri died, and eventually more money was found and now fifty years after the event Il Grande Cretto di Burri is nearing completion. There is a difference between Folly and a Folly. The new town of Gibellina Nuova was built for the inhabitants of old Gibellina but put up ten kilometres away. The chosen site is scorching hot in summer and freezing in winter. The surrounding countryside is nowhere near as pretty as at old Gibellina. Distinguished architects were called in to design the housing and the amenities, but what is ideal for a Piedmontese is not necessarily ideal for a Sicilian. We drove slowly around the town. The road system is deliberately obfuscatory, and there are buildings the purpose of which is completely baffling. In the centre of the town is a vast concrete structure with five arches, pierced with lenticular holes, purpose unimaginable. If pressed we might hazard it was a huge multistorey car park built for a shopping complex which never got built. 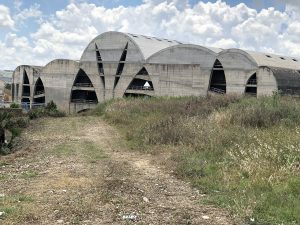 I’ve done a cursory search on the web and it appears this is an unfinished theatre, begun in 1984 by abstract sculptor Pietro Consagra. A gigantic theatre for a town of some 4,ooo people, stunned by personal tragedy, and left unfinished for 34 years. This defines Folly. And it’s not amusing. Von had a cold. This means a sore throat, which is never complained about, and very occasional coughing. There’s no filling wastepaper baskets with tissues. That’s too unseemly. The cold is invisible, but it made her even quieter than usual. I didn’t have a serious hot flush since that first night at Agrigento, and my hay fever stopped the minute I stepped off the plane at Palermo. I only had two conniptions. Liliana brought round two puddings one evening, and we made a policy decision to eat them after our dinner. We got back to the shack and I took the two bowls out of the fridge. We both took about two spoonfuls before we looked at each other, our faces screwed up in disbelief. We have honestly never eaten anything so sweet. It was as if she’d poured honey over a kilo of sugar. All we could taste was Sugar. For light relief, she’d added candied orange peel. I think it was a deconstructed canola with added sugar. And sugar on top. With sweeteners. The answer was to haul out the disgusting ‘VIN LIQUOREUX’ I’d bought by mistake and glug it down. It tasted positively dry by comparison. I now know what a sugar buzz is, and how Americans react to caffeine. We couldn’t finish the puddings. The room was swinging around me, and I felt — well, not ill, but really unstable and uncomfortable. We went to bed and where we normally have a glass of fizzy water each we both drank three before we could settle down. In the morning my mouth tasted of sugar. We had sugarless tea followed by sugarless espressos, and we squeezed a couple of extra lemons into our orange juice. But how kind of her to think of us. And the curious Modica chocolate, made to the same recipe since chocolate first arrived in Sicily in the C16, probably doesn’t have to be as sweet as the bag Liliana made for us. We only managed two, but they were elegant affairs indeed. We expected to see our boys at about 02:00 in the morning. Instead at that time we were in a flea-pit in outer Palermo, an hour and a half from the airport. Ryanair had cancelled our flight without warning, and after two lots of check-in queuing (1h 40m) they condescended to fly us home at midday the following day. They put us up at the San Paolo Hotel, a tower block from the 1960s, like Astronaut House in Feltham, in the roughest area of Palermo. The windows hadn’t been cleaned in months, a sure sign that nobody cares. There were bullet holes in the bath tub, the beds were hard and my ankles were chewed all night; a week later I’m still slapping Eurax on them. Our wonderful neighbour Marilena came over and slept on the sofa to comfort Milo, as our housesitters Ev and Paul had left early on Thursday morning. All was well, except Bembo The Cat managed to run up a £160 vet bill. Happy days! Wonderful Recount! After the first tempestuous photos on Facebook I thought you may have a negative opinion of Sicily, but how ever could I have doubted the dynamics of all the other factors besides weather? Bravi! Don’t wait another 71 years to go back . . . or to visit Napoli / Sorrento again!